Spring training in Arizona...when you retire to Arizona, you can enjoy attending spring training baseball games played by the 15 major league teams that call Arizona home. 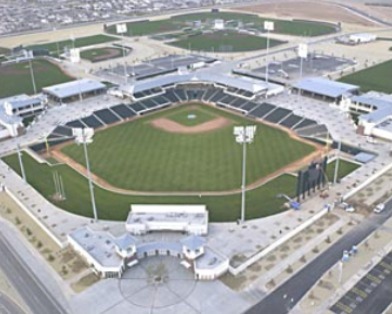 Since the Arizona Diamondbacks and Colorado Rockies are moving from Tucson to a new ballpark, at Talking Stick Resort, in 2011, all 15 teams are playing in the Phoenix area. Games will be played this year from February 25 to March 29. For the season opener, our own Arizona Diamondbacks play the current world champion San Francisco Giants in Scottsdale on Friday, February 25. That baseball showman, Bill Veeck, as in wreck, the owner of the Cleveland Indians...convinced Horace Stoneham, owner of the then New York Giants, to move from Florida to Arizona for spring training in 1946. What prompted the move? Veeck had recently signed Larry Doby, the American League's first black player. Due to segregation laws in Florida, Doby could not stay at the same hotel with his white teammates. This did not set well at all, with the Cleveland Indians, and turned out to be Arizona's gain. The Indians started in Tucson,the Giants in Phoenix...they were the only teams in Arizona until 1951...they must've gotten tired of playing each other. In 1951, Del Webb the owner of the New York Yankees and Arizona retirement real estate pioneer, swapped spring training sites for the Giants. That was a memorable year, when Joe DiMaggio passed the torch to a young slugger from Commerce,Oklahoma...Mickey Mantle. There are now 15 teams enjoying the Arizona sunshine... an equal number to those teams that train in Florida...give them time, they will soon be in Arizona as well. Surprise Stadium spring training home of the Texas Rangers and Kansas City Royals. This stadium is 5 miles from our home... The stadium opened in 2002, and seats over 10,000. It is a first-class operation that is staffed by community volunteers...hope to see you there and enjoy some great baseball...spring training in Arizona, another reason for you to retire in Arizona.